But not just that — I never understood, design-wise, why the 2DS wasn't foldable. How does that make the 2DS more child-friendly if the screen(s) is constantly exposed as opposed to being protected in a shell? Speaking as a Koopa, I can confirm that my shell increases my defence. The 2DS having a shell should increase its defence as well! Why the hell wasn't the original Nintendo 2DS comfortable to hold?! If you look at the comparison sheet offered by Nintendo, the New Nintendo 2DS XL essentially takes the exact same larger screens, design, and stereo output of the New Nintendo 3DS XL, and puts it at the same weight as the Nintendo 2DS, while including an AC Adapter. The only benefit to the Nintendo 2DS is that it's at a budget price of $80, and the cheapest way to game on the 3DS family. Recommended if you're buying the handheld just to play 1–2 games, like I know some people do with literally just Pokémon. You get what you pay for. A deep library of games! Play most of them! If the New Nintendo 2DS XL existed a long time ago, I would've bought that instead of the New Nintendo 3DS XL. I don't use the 3D. Ever. In fact, I belong to the small subset of the population that doesn't see the 3D. I always thought the 3D in the 3DS was a total failure and a worthless gimmick, so that makes the New Nintendo 2DS XL is the highest form of handheld. All of the benefits without the cost of the worthless gimmick! No matter how you look at it, this hardware revision simply confirms Nintendo's commitment to continue the Nintendo 3DS in the face of the Nintendo Switch's existence. It's baffling, but, hey, there you go. Ludwig won't buy a New Nintendo 2DS XL even if his New Nintendo 3DS XL decides to go and die tomorrow. (...It better not!) He's reserving his Nintendo hardware money for the Nintendo Switch, which still remains elusive. My thoughts went from "Meh, another 2DS" to "Oh, I'd buy this!" the moment I saw the clamshell design. I never use the 3D either, so this sounds like the perfect upgrade if I decide to replace my 3DS. The clamshell makes all (...well, most) of the difference. If your 3DS were to fall apart, would you replace it this late in its lifecycle? Unless they announce or hint at a successor that has backwards compatibility, yes. I still have quite a few 3DS games to play. If I thought it was likely to be soon, though, and my 3DS broke, I'd probably wait a while first in case they announced a successor. How long will you wait for a successor? Since my 3DS is currently not broken, I don't intend to replace it at all yet. If it has the same processing power as the New 3DS (ie it can play Hyrule Warriors Legends well) then count me the heck in! There were only two reasons I even bought the New 3DS in the first place: That game, and the fact that the screen somehow cracked on my 2DS FROM WITHIN when I kept it in the glovebox for a while. For crying out loud, it wasn't even a bumpy ride! So I wholeheartedly agree with your assessment of protective shells. It does have the same processing power as the New 3DS. The majority of the people who wanted a 3DS or 2DS system already have one, so it seems like this is releasing too late. 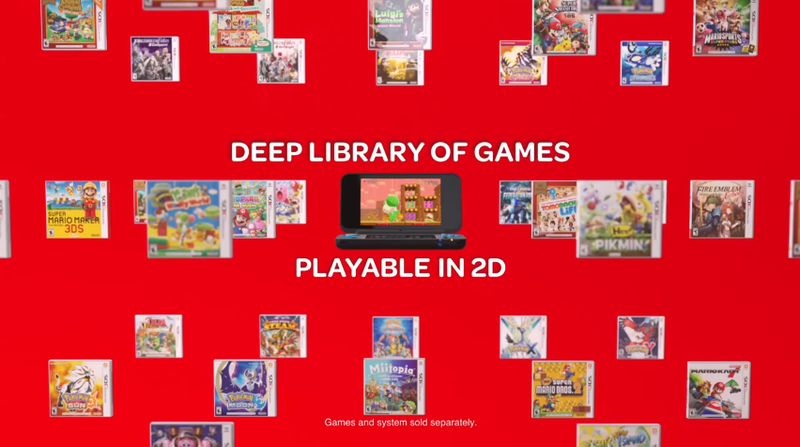 With very few games releasing in the future, at least those who buy a 2DS XL will have an expansive library of older games to choose from. It's clear the New 3DS XL targets already-existing owners of 3DS hardware (hence, no included AC Adapter). The New 2DS XL would therefore target... strange people who don't own any 3DS or 2DS. Maybe this is what they think fans of Pokémon GO and Fire Emblem Heroes will buy?